As you all know, since I bought the Viper I only post/read/care about Vipers because every other car is trivial nonsense. Wait, this isn’t the point. The point is about used cars and Vipers 1 of 1 program. Cars sold in bespoke trims, I’m looking at you Bugatti with your special edition Veyrons, depreciate faster than normal production cars. Side note: do you think there are more standard Veryons on the road today vs the sum of every special edition Veyron created? When cocaine charlie finally gets his big pay day and built the GTS to the left. He thought the world would envy him. He thought he would resell this for more than he bought it for because well look at it. Take it all in. What he found out was the rest of the world did not enjoy his phenomenal taste even though he showed restraint to not make the base color fuchsia. Next time, go for it Charlie paint the world an weird shade of purple. It is your world, we are just living in it. People used to have to go out of their way and spend a lot of money to make things look horrendously bad forever. Most car owners today can have the same lack of class and pay half as much with vinyl wraps, but no one ever respects them the same way as painting a 4 foot tall Viper on the hood of your car. When it comes time to sell your Caribbean Joe vinyl print Chrysler Sebring, you peel it all off and return it to the original shade of baby soil green and sail away. Yeah sure, you may see the occasional pink hummer offroading over Starbucks curbs on a Saturday, but that isn’t the norm. The pictures Dodge released to promote this program show their designers have escaped their cubicles and found the Hot Wheels tree house to team up and create the first and last paint jobs in the post. Here is my question. Will the Vipers made through the 1 of 1 program with the a color palate even Leonid Afremov would be jealous of, sell for less an equal Viper in a standard color combination? I think in a few years we are going to have some really crazy painted Vipers selling for way less than others on the market. 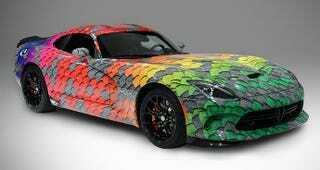 If you can stomach driving around in the new cocaine Vipers of this decade, you may be able to do it for a bargain. I would bet they will sell for 6k-10k less aka the cost a mid grade to excellent paint job will run the buyer. Only time will tell. If the examples above are any indication, then we are off to a fantastic start. A weird coincidence as I was writing this, Tavarish was writing about the same thing.